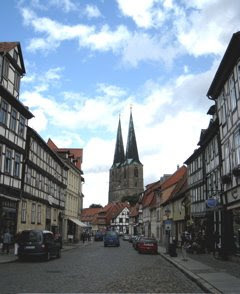 Yesterday, Quedlinburg was what came up when we turned the page of the itinerary. Today - a sunny ( if fresh) day, we awoke to discover that it is a beautiful town whose history dates from the l0th century and which is full of amazingly intact romanesque and half-timbered buildings - tons of them. It was named a UNESCO world site in l994. Needless to say it was a wonderful surprise and a relaxing and inspiring day.